Let me get this straight, bourbon is made in new charred oak barrels (typically aged at least 6 years), after which, these barrels get shipped off and used to hold and age scotch for another 3 years, and then after that XBeeriment gets a hold of a few of those and puts their #44 beer in it for 3 months. I don’t know how much more this wood has to offer. The 50 CL bottle poured out and left a quickly fizzling 1/4 inch tall George Hamilton head, leaving just traces which you see in the picture. The smell of smoke comes through at an honest 4 out of 7 Smokestacks. The taste also charts a 4 Smokestacks, and also prompted me to say, “Hey, this is a good beer.” Maybe the thrice used barrels are the key to success here, which is surprising considering how often barrel aging ruins beers. Beware of the silt floaties and sinkies, however. Using proper pouring techniques can minimize any floaty concerns. It’s got the flavors of a robust burly bruiser beer but not on the immense level one might hope for. Tasty, good, 5.8 Smokestacks of Overall Happiness. Brewer’s Description Brewed to celebrate Barack Obama’s inauguration as the 44th President of the United States- a roasty, smoky (thanks to the inclusion of peated malt), and potent stout , with loads of citrusy notes from the US hop varieties. 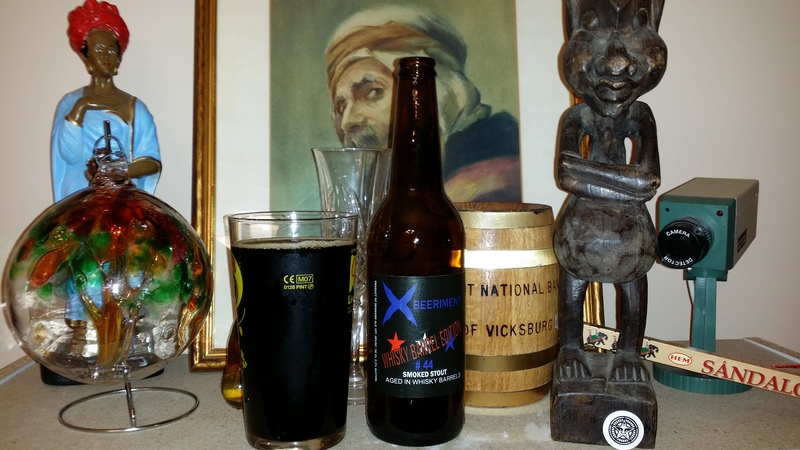 This entry was posted in Beer, Educate, Enlighten, rauchbier, Smokebeer and tagged 5 - 6, barrel aged, Denmark, Stout, X Beeriment. Bookmark the permalink.